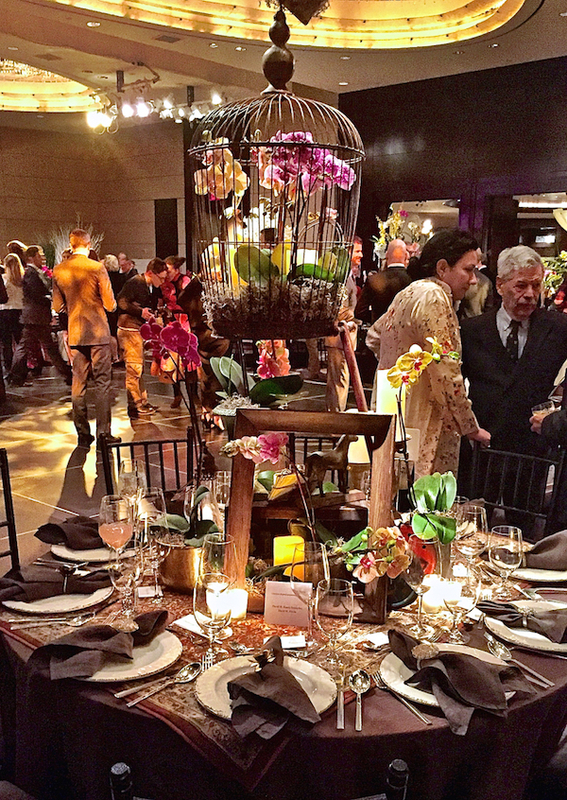 The tables at the Veranda NYBG Orchid Dinner were amazing in their diversity and creativity. 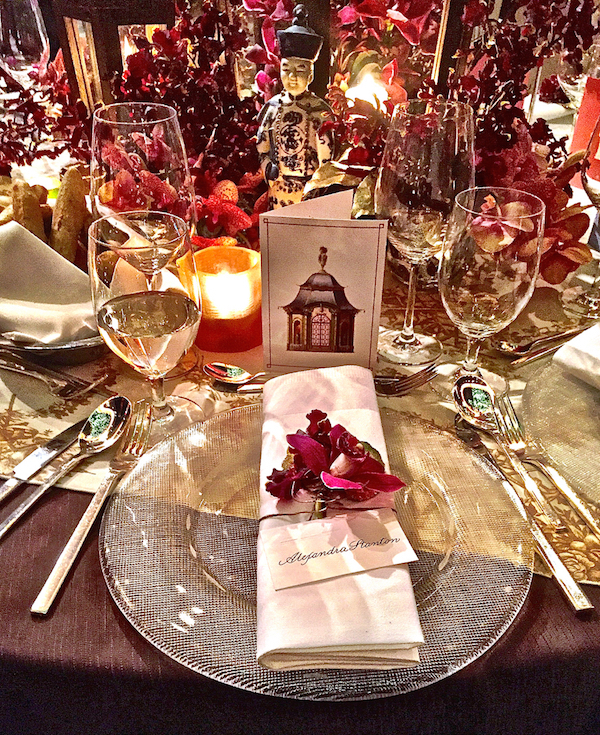 Some designers focused on the splendor of the floral centerpieces while others chose to exhibit their talents for stylish entertaining. Veranda contributing editor Danielle Rollins has long had a passion for the latter as seen in her pieces for the magazine and her book Soirée. 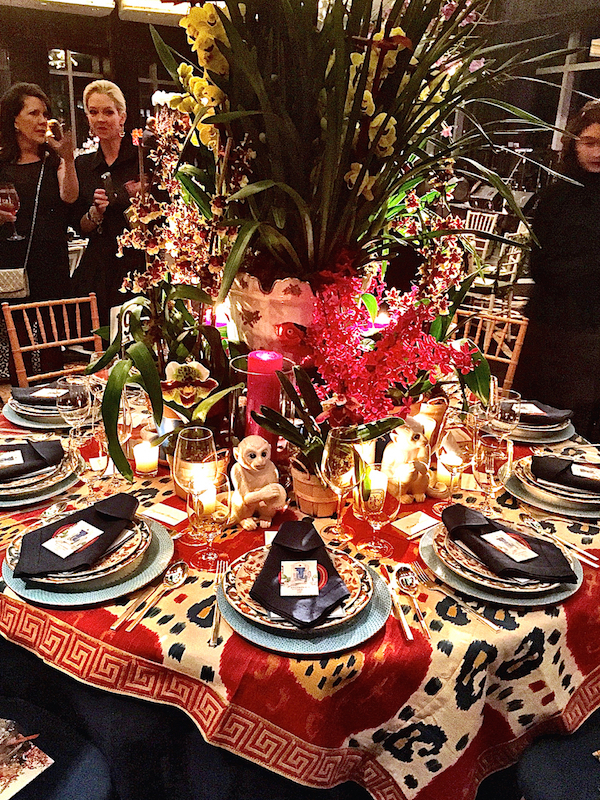 Her table was a study in spirited and layered eclecticism. With a navy underskirt of SFERRA linen, she used one of my favorite Brunschwig patterns, Samarkand, as a topper, edged with Samuel & Sons’ bold Aristotle Greek Key – a wonderful pairing. Partnering with Mottahedeh, she featured their lace service plate in turquoise, the historically inspired floral Merian dinner plate, topped with the Sacred Bird & Butterfly dessert plate, a pattern I also own and frequently use for layering. 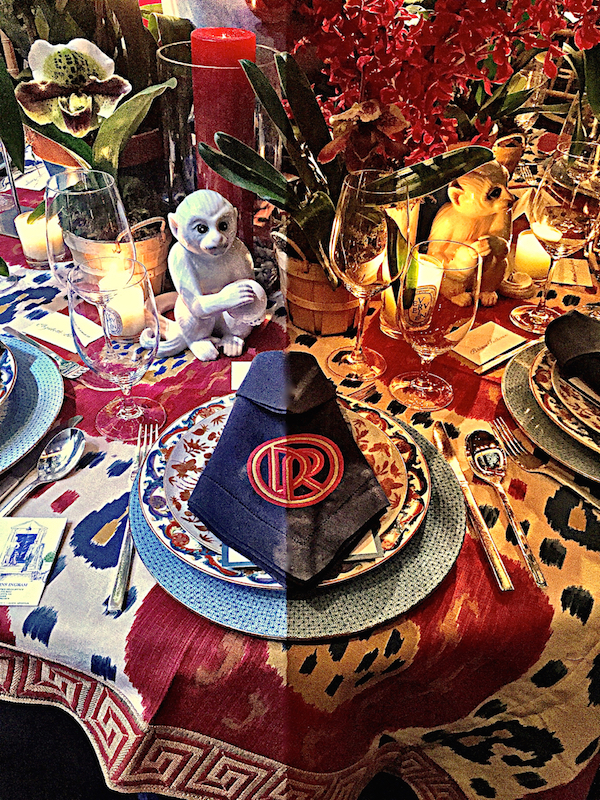 SFERRA Festival dinner napkins received a dramatic monogram treatment from Number Four Eleven continuing the navy and red theme. Various cachepots, whimsical creamware monkey bookends from Mottahedeh, and candles from Diptyque and Creative Candles completed the festive scene. 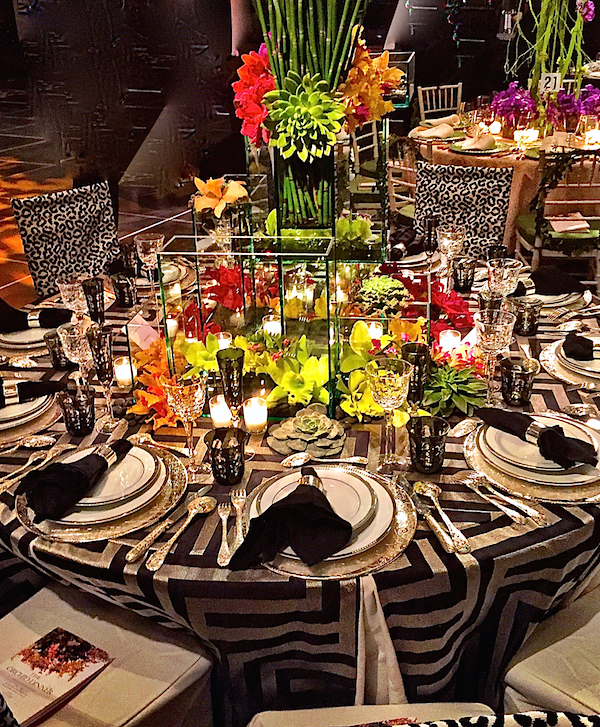 I always look forward to Selina van der Geest‘s Orchid Dinner tables that she collaborates on with artist Brett McCormack. They are consistently beautiful, creative and unusual in their out of the box treatments. 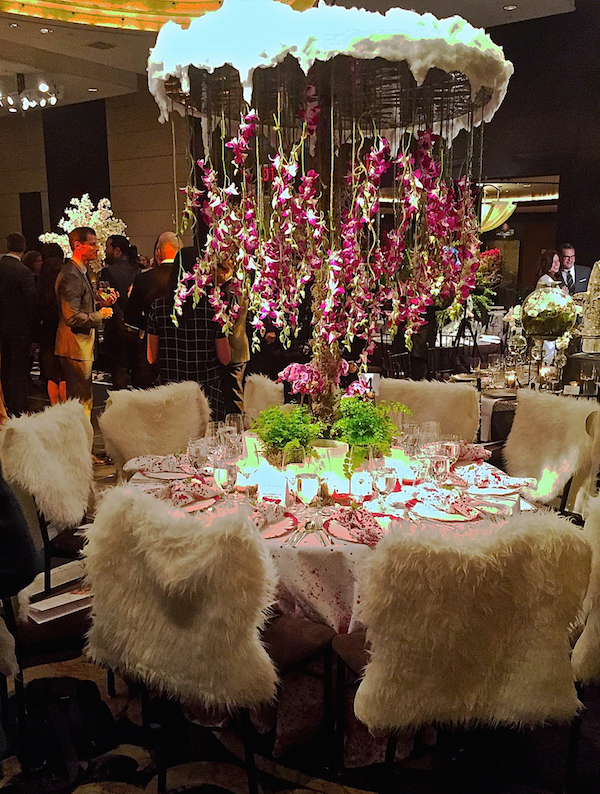 This year’s Snow Orchid table clearly referenced the Botanical Garden’s upcoming Chandelier Orchard Show. 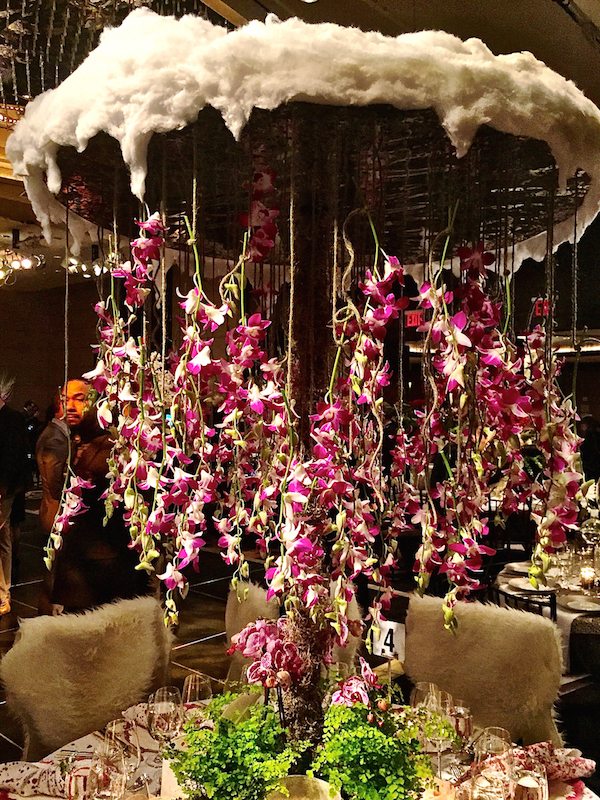 Yet with a play of textures and custom tabletop, it is transformed into a fantasy winter wonderland of cascading flowers. 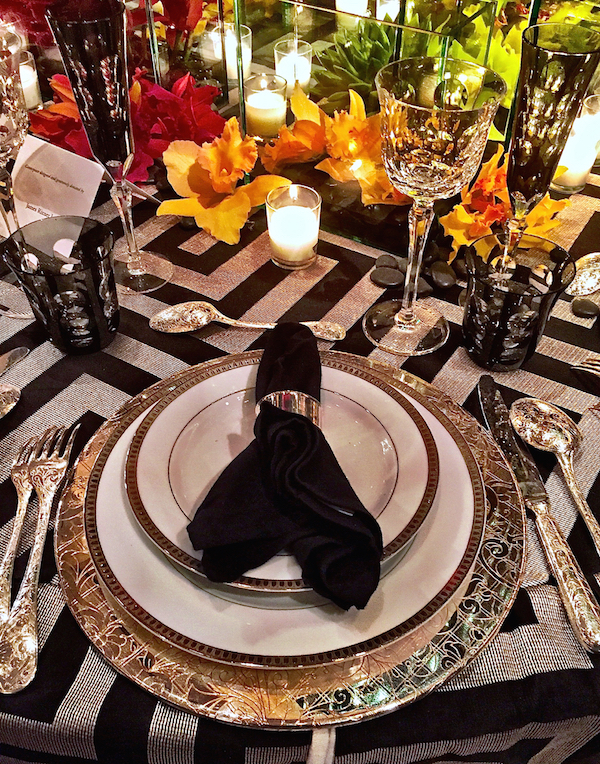 Designer James Rixner partnered with Robert Allen’s Beacon Hill and Christofle for his glamorous table. The grand scale geometry mixed with subtle metallic bling on the Olympus tablecloth paired perfectly with the stylish Cheetah Velvet on the chairs. And I loved that he picked several of my favorites from the line. The dark grey Kawali goblets and champagne flutes are fabulously chic and the Marcel Wenders Jardin d’Eden chargers and flatware are modern classics. 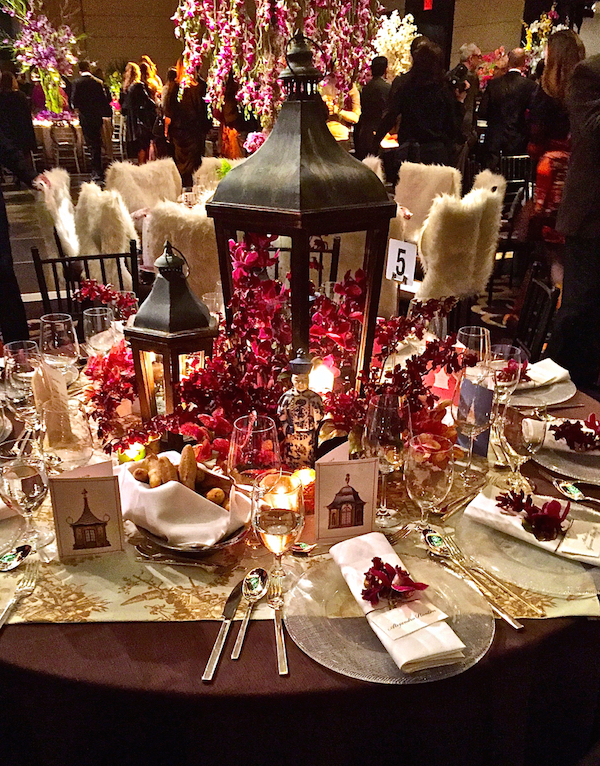 Mixed with the glass centerpiece, it’s all just the right amount of bling to feel festive but not over the top. David Handy‘s Memories from the Attic table was a through the looking glass nostalgic nod to the past with a small oriental rug on the table, orchids in a variety of vintage looking pots and an orchid-filled birdcage as chandelier. It looked like a very warm and cozy spot to have dinner! 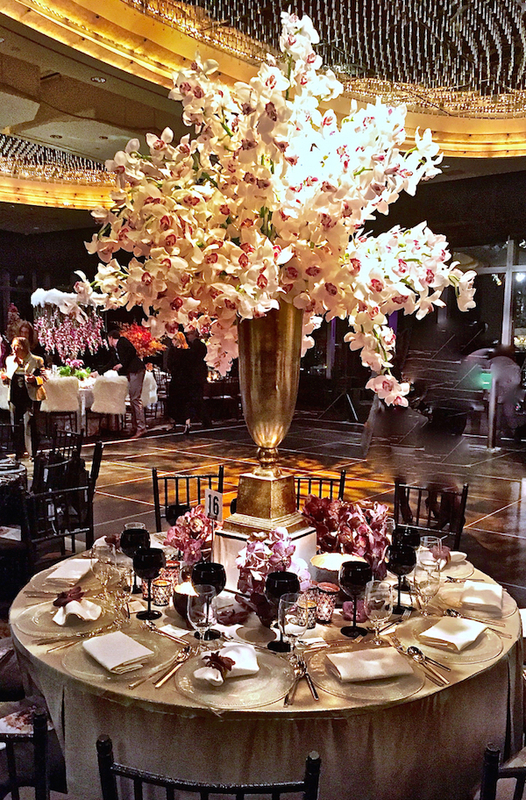 FlowerSchool New York created a chinoiserie chic table with lush orchids overflowing from the centerpiece lanterns. My favorite Pagodas notecards from Andrew Zynga served as placecards. And I liked the very simple but elegant orchid tied over each napkin. 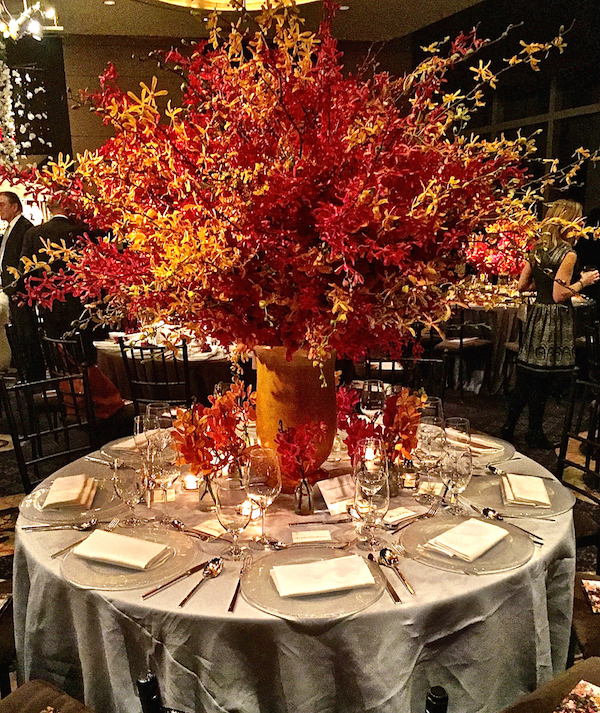 One of the most statuesque centerpieces was executed by Lewis Miller. In a glorious tall golden vase, an enormous bouquet of resplendent orchids overflowed. Really wonderfully graceful proportions contrasted with the low table setting in a lovely contrast of black and lavender for a truly elegant table. And lastly, a fabulously vibrant and colorful centerpiece from Carlos Aparicio looked perfect in a monumental Svend Hammershøi for Kähler vase from his Gallery BAC. 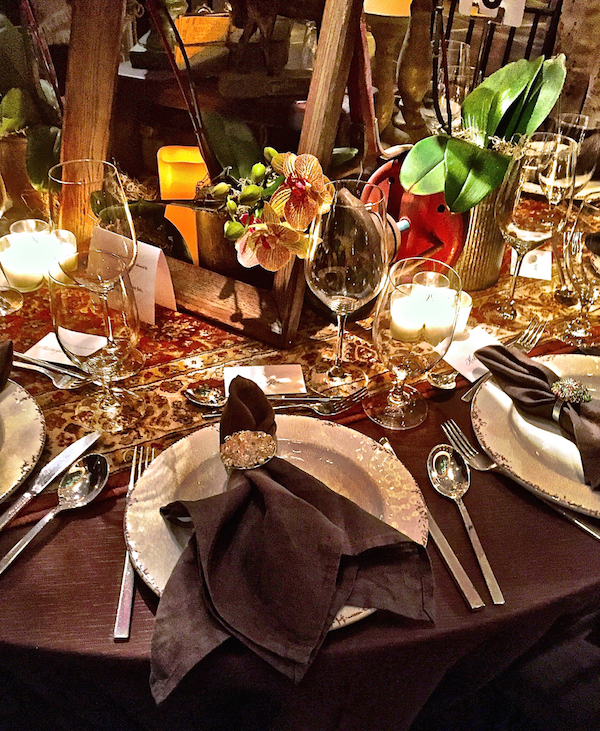 Congratulations to all the designers and Veranda for a wonderful evening of stylish entertaining. And of course thank you to the New York Botanical Garden for continuing to provide us all with such a magnificent landmark to enjoy for its beauty, educational programming and important horticultural work. This entry posted in Uncategorized. Entry Tags: Entertaining, interior design, New York Botanical Garden, Orchid Dinner, Orchids, Tabletop, Veranda Bookmark the permalink. I have enjoyed these posts, Stacey. 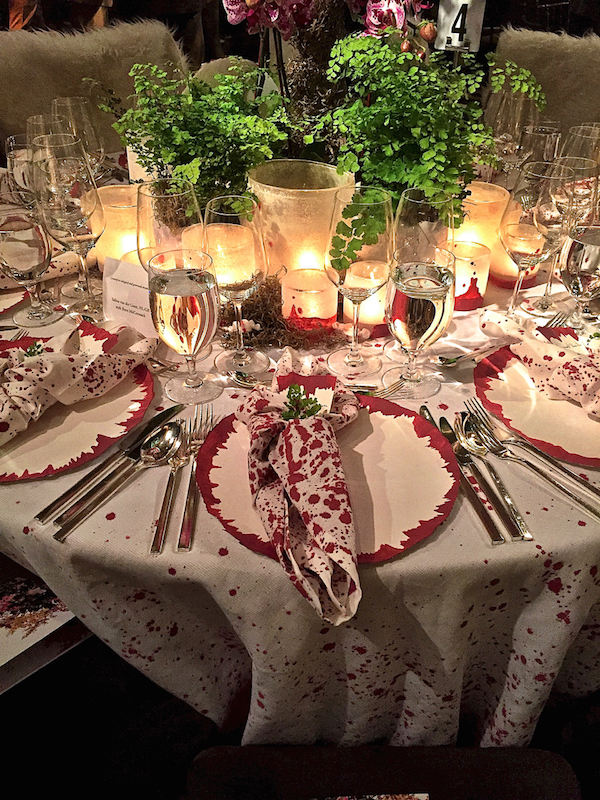 SFERRA was so pleased to partner with talented designers Danielle Rollins and Bill Ingram on their Orchid Dinner tablescape–their design and color scheme was truly lovely, and their use of our SFERRA Navy Festival linen napkins was oh-so-chic. But how could it not be, with that stellar monogramming from Number Four Eleven! Kudos to Danielle, Bill, and all the designers who created such wondrous beauty for this great event. Fabulous combination of exotic nature and exceptional style! Thank you for sharing an amazing collaboration of many talented designers. Beautiful!!! A beautiful article! I loved seeing Number Four Eleven mentioned for the Sferra Napkins. It is a great shop full of inspiring monogram ideas. A real “go to” if you are ever in Savannah, Ga.
Wow, what an experience working in this table with James Rixner. James intent was to honor the magnificent Falling Water by Frank Llyod Wright. A creative way to make this table timeless and, modern and super chic! 81 queries in 0.727 seconds.